I went to school in Edinburgh, and university at Cambridge before arriving on Scoraig in 1974 with a desire to get back to hands-on basics. Life was basic then, but in 1978 I decided to build a windmill like a couple of my neighbours to provide electric lighting in the crashing winter storms. Nights are long in northern Scotlan d during winter. Before the trees grew, the force of the wind was pretty scary. Here is a part of my brakedrum windmill plans of 1993, explaining how I made the stator. I did not have an Apple Mac in those days. I got a job in Africa designing a wind turbine for local manufacture in Zimbabwe. They wanted me to use the brakedrum idea there too. However when I got there they told me it was much cheaper to cast a drum locally than to use one out of a truck. The windmill actually worked pretty well and the guys there set up a company called AWP with the aim of building them for export to South Africa and the USA. Not the original idea of rural development but it worked for them. Nowadays the Xzeres turbines are the legacy of this design. I also got another developing world job working for ITDG (now Practical Action) in Sri Lanka and Peru, helping them to make permanent magnet alternators for small wind projects. I went for the simplest design this time – the axial flux alternator – and I still like them best to this day. You can download this design here http://www.scoraigwind.com/pmgbooklet/itpmg.pdf although I have improved it a lot since then. Congratulations go to you Hugh on having created a website absolutely brimming with helpful information and no bulls**t on wind energy and how to harness it. I have spent over two hours reading what you have published and I am thoroughly impressed by what I have read. I do wish that I could harness the power that is untapped in the wind where I reside but unfortunately after reading what you have said about “built up” areas I now know that I would be wasting my time and money trying to do so. Maybe in a few short years when we move into rural Northumberland I will try some of your designs and let you know how I get on. I hope you find that the D2450 solid state relay is to your expectations. I’ve finished making the stator for my new 4.2mtr turbine which I managed to get out of the finished mould at a thickness of just 14mm. I made a slight modification to the mould and thought it could be useful to others. When I formed the faces of the stator mould and the center island; instead of leaving the faces of the plywood square, as cut I created a chamfer on both, I then finished the faces with a smear of car body filler. This gives a good surface to wax. When assembled the faces create a small angle which means that the finished stator just fell out of the mould. Far easier than bashing with a hammer to get the item out of the mould. The rotor discs are due back from the galvanisers next week and once the mags are on I will use the same trick with the rotor mould. Glad it came out cleanly. A bit of a fillet of something in the corner is a great idea. I tend to use grease (since it is cheap to buy) and smear it on liberally and run my finger around so it leaves a fillet of grease in any corners. Mostly the casting will drop out nicely but sometimes if I have not been lavish or the grease soaks in it can stick a bit and need some rough treatment. I don’t have a windmill but I’ve been reading about them. People complain about them a lot. You need to start opening their eyes up to some reality. They’re complaining about the wrong things. I live in Florida. We have nuclear power here. Texas has 2 nuclear power planrs at 3 Mile Island. Look at how many nuclear nuclear plants has had major problems and at how many people and wildlife has been hurt by them. They can kill you when they go bad even if you live all the way across the world. They should be out-lawed. They are a threat to all of the people of the world. We had salmom affected by Japan’s nuclear plant. It affects all life, both plants and animals. Why aren’t you trying to force the shut-down of plant 1 on 3 Mile Island and replaceing the area’s electric power with power from windturbines. What are you murderers who wants a world killed off from radiation and atomic waste. It don’t just go away. It lives on and on. People don’t. Once Plant 1 is replaced Plant 2 needs replaced. I agree that windpower along with other renewables are a better option for the future of electricity supply than nuclear plants. I do not agree that I am a murderer. I do not use nuclear power myself but I do not devote my life to shutting them down either. Maybe it would be a good thing to devote yourself to, but you will need to be calm and very rational to persuade decision makers, rather than making emotive and offensive statements. long time no hear, hope you’re fine. i want to make a high-rpm alternator for special purpose, with a minimal air-gap; same size like d one for a 3m-genny i built. actually they shall be interchangeable. last one, following your work-book advise, i embedded d coils in a 10mm plywood sheet. this time i’d like to use only 4-5mm, so i thought maybe ply isn’t stiff enough? could i use aluminium sheet, or is there a negative impact on d magnetic field ? Sorry for the delay. It’s better to email me if you want to get in touch. I don’t check this often enough. I don’t embed the coils in plywood, no. I use plywood to make moulds and then I pour in resin and when the resin is set I remove the casting from the plywood mould. There is no plywood in the finished stator. I do not recommend using metal in the stator. 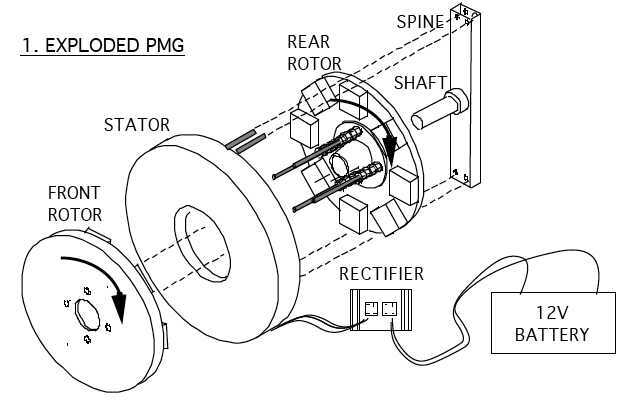 The magnets will induce eddy currents in the metal. This wastes power and slows the blades down. that’s true for all metals, even non-magnetic like aluminum?? another idea is phenolic board, don’t know yet how stiff thin one is. Magnets moving past any piece of metal will induce voltages in it, and since it is a conductor there will be currents circulating in any suitable pathway. We harness this by using copper wires but you will also produce currents in any other metal within the air gap that provides suitable circuits and this will waste power and brake the turbine. Have you any practical updates on the Hornet 1kW turbine, made in the UK? I read your blog and you said that you had one and would see how long it lasted. Is it reliable and has it got a good bang for the buck? I cant reach them by telephone. it was a neighbour who bought one and it did survive a winter here to my surprise. He took it down when I made him a 4 metres diameter machine. The Hornet was really too small. I don’t think it had any significant problems, but he is not using it and I don’t think anyone else has much use for something as small as that. I am looking for the top component of a hutchinson tower for a proven 6kW turbine. This is the top tubular section where the turbine mounts. This is referred to as the 127 CHS assembly in the installation manual. I would be grateful for any suggestions about how to get hold of one of these. Dear St Hugh – I’m not being facetious; your patience is only comparable to your knowledge of everything HAWT! I live in the remote south of Tasmania and I’m trying to get rid of power company (50% of my bill is for charges unconnected with power usage) towards which I built a home-made turbine following your advices and others’ but got to an unsurmountable snag when it came to build the alternator. I started with 16 Nd 40x20x10 magnets on a 380mm disc and 12 Brooks coils made of 0.6mm wire (OD 50mm, ID 28mm, thickness 13mm). Each coil outputs 3 ACV by spinning the blades by hand (maybe 200 rpm) but the output of the 3-phase star configuration is a paltry 9 ACV! Is this dismal performance due to the fact that the spacing of the coils in relation to the magnets is not the perfect recipe (coil hole equal to magnet width and magnet covering simultaneously the width of two adjacent coils, that is, the start and finish of two copper “rings” being covered by the magnet)? I have tried without success to get an answer from other sites and now appeal to you as my last resort to this conundrum. Your help is much appreciated in my quest for power independence. Thank you. sorry for the delay as I have been on holiday. I am swamped in stuff so it would really help if you could send pictures so I do not have to construct the geometry myself. Send to my email if you can’t post it online and link to it somehow. 40x20x10 is quite a small magnet. What is a Brooks coil? Can you link to pictures? How many turns and what size wire? Are you using 4 coils in series per phase and connecting star? If one coil is 3V then you ought to see 20Vac from phase to phase. Thank you for your kind reply. Brooks coil is a concentric, doughnut shaped (width=depth). I read many of your “lessons” and suddenly the penny dropped: some of the coils were upside down and were cancelling each other out. Got some decent wind the other day (the Roaring Forties have been amiss for a long while) and the machine got to 45 VDC and all’s well – except the test globe that got fried! You are becoming a legend. Cheers. PS – By the way, I confess to my heresy: the machine is a VAWT. I really want to now how many turn of winding ciol need for 50 to 60 rpm. Thanks for your previous answer. If you turn at 50-60 rpm then you can do this with any number of turns you like. You can do it with one turn or a thousand turns. The difference will be the output voltage will be higher or lower in relation to the number, size and strength of the magnets you are using. If you refuse to tell me anything about the voltage or about the magnets then I am unable to help you to decide the number of turns you might best use in the coils. YOu can use whatever number of turns you wish. number, size and strength of magnets used. If you can give me full information then I can assist. Hi Hugh, thanks for your replay. Our configuration is 60 coils and 80 magnets. (uni-polar) We need 3-fase, so it easy to wiring 20 coils in serie. But, I think this give a to high voltage for a wind Inverter. What if we wiring two strings of 10 coils in serie and place thems parallel ? This give a double current en and lower voltage… ?!?! Or is it better to use less windings with thikkens copper to get a lower voltage and higher current ? You can use fewer coils in series or you can use fewer turns per coil. If you are building a prototype then it may be a good idea to use plenty of turns per coils so that you can later play with different combinations of series/parallel connections to get the voltage/rpm that you need. With 20 coils you can have 10 coils, 5 coils, 4 coils. It would also be possible to make a delta connection and produce another range of output voltages. Later, when you know exactly what you want, then it is probably best to have all the coils in series and star. This allows less possibility of parasitic currents in the stator. YOu can find a number of turns per coil and a wire size to do this after the prototype has been tested. Hi, a great site with very helpfull information. I work on some ideas and proto for a 3-fase wind turbine and the idea is to use 60 coils in a circle and 10 poles. The idea is to use a standard Solar Inverter to generate 230VAC/50Hz. The most wind turbines I found on the internet are 3-fase. What you think about the configuration 60 coils and 10 poles ? 10 coils in serie to get a high voltage. I guess that the coils are overlapping if you are using so many. Take care with the solar inverter. It can be damaged by open circuit voltage. This voltage is much higher for wind turbines compared with solar panels. So you will need some sort of regulator to proetect the the inverter. A “clipper” type of thing also known as a wind interface. Maybe try Ginlong. The other problem is you need a “wind inverter” and not a solar inverter. MPPT that works for solar is not so great for wind. With wind the maximum power is hard to track. Normally we use a wind inverter and we program a power curve (power vs voltage) for the turbine. I like to try to make sure that most of the flux from each magnet enters to each coil and leaves it again. But sometimes it is OK to olny have part of the flux linking some of the inner turns of the coil because they are only quite a short piece of wire. When I lay coils out side by side in a circle (not overlapping) then I mostly use 4 magnets for every three coils. This makes 3-phase. In your case with 60 coils I would use 80 magnets. It may be better to use fewer, larger magnets and coils. Savvy analysis . Incidentally , others are searching for a OR Form 45-21 Instructions , my colleagues discovered a sample form here https://goo.gl/jfUMYL. Hugh, Do you have any plans to attend Glastonbury Festival again? I attended a brief workshop last year and they made reference to yourself / tried and tested plans! Sorry I will not be at Glastonbury, no. See my calendar of workshops (under the courses menu above) for events. I will hold another one myself next year. I have a 12V dynamo and I am looking to make it into a small battery charger for amateur radio. Been looking on eBay and there are so many blades for R/C helecopters with different lengths ETC, I do not know which ones to use or how to connect the blades to the main drive shaft on the dynamo itself. So any knowledge or information on how to go about this will be welcome. the dynamo will have a speed (RPM) rating as well as a voltage one. This is vital data for design. I have no knowledge of remote control helicopters or their wing sizes or shapes but no reason to think they would be suitable either to be honest. You have to match the blades to the dynamo for both speed and power. 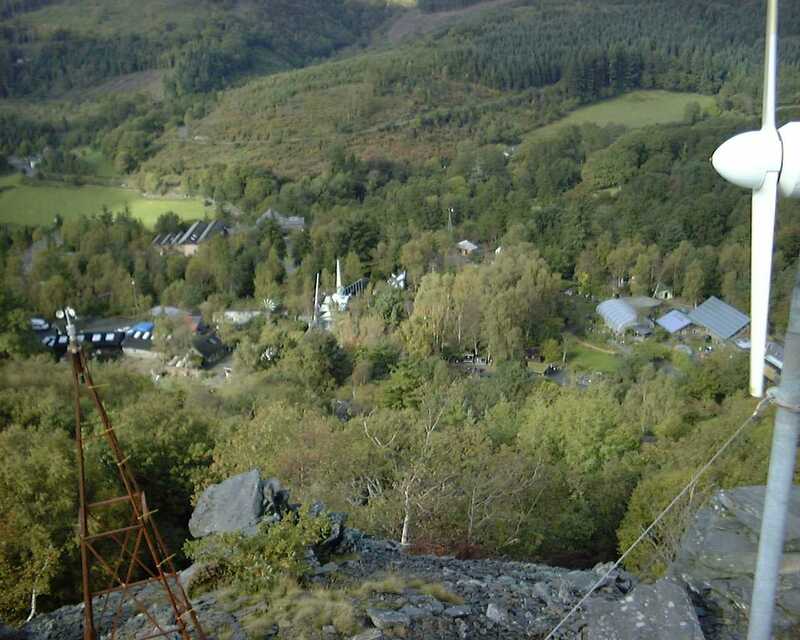 My name is Henry Wyatt and I am a second year student studying Renewable Energy Bsc at The University of Exeter. Through my studies I have gained a passion for wind energy and hands on engineering projects. I am hoping to find some voluntary work within this sector between the dates of June-September 2015 if you know of any projects/companies that are seeking volunteers then please could put me in touch. Any information you can share would be greatly appreciated. Whats the difference between your workshop and recipe books? Windpower Workshop is a general book on the subject with a lot of background, that I wrote almost twenty years ago. It’s full of the ideas behind the subject but is not really the best basis for a hands-on build as such. 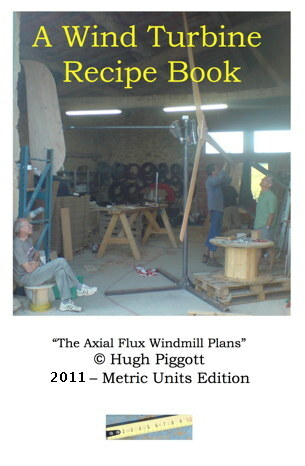 The Recipe book is my latest, up-to-date thinking condensed into a series of detailed instructions for actually building wind turbines in a range of sizes with all of the information you need, based on my experience teaching courses. The two books complement each other in many ways. My names Mark, I’m a student at Strathclyde University and I am doing a investigation into the sustainability of small scale wind projects in Malawi. Over the summer we built a 1.8m turbine from your recipe book and i was wondering if you would have power curve data for this size so that we can calculate the theoretical energy produced from the turbine? I believe that hard drive magnets have multiple poles on their faces and need to be (carefully) cut in order to use them for projects like this. There may be other alternator geometries that can work without cutting such as axial flux with the long edge of the magnet in a tangential position. Just a thought. I was wrong. The link above takes you to pictures of the prototype in question. Look forward to your thoughts and advice. I don’t see the link, sorry. It’s hard to help you unless I know a bit more detail. I agree with Tom that the hard drive magnets have multiple (two) poles in them. So it’s a challenge to make an alternator. Maybe a very small one would work out so the poles are evenly spaced n-s-n-s, and then you need very small coils. To charge a cellphone the wire can be very thin. I received training in Coloroda with Dan Bartmann and company and since then I have been attempting to build very small and low yield windmills mostly for the purpose of charging cell phones in rural parts of western and cetnral africa using mostly recuperated parts (wire from , magnets from abandoned hard drives, pvc blades from discarded plastic piping, and wood from discarded signage). The goal is to build using locally available parts without importing anything. I have had mixed successes using a model, which I have come to learn is named after you. I looked at windempowerment.org but did not see anyone building models at that scale. For the alternator I wound 6 coils using 21 AWG with 100 winds alternating clockwise and counterclockwise. I intially fastened them to a PVC pipe using metal studs and then I thought that the metal bolts might create too much cogging so I removed them and used glue instead; Still output has been only 2 or 3 volts in both scenarios. For the rotor, I recoved neodynium magnets from harddrives and attached them to a cylinder piece of wood – each magnet with a steel/iron backing. For the motor, I used 6 – 15 inch PVC blades. I did not expect the unit to last long in wind but the idea is to be ablet to repair broken parts using local parts. The entire unit cost only 4 dollars to build. I am thinking that, with improvements, I could go as high as 15-20 dollars if necessary. I do not want to mass produce – just introduce this technology as an option for the demobilized rebel groups and other youth I encounter with in my line of work. Any advice on building a small model of the type I am de scribing. I would send you pictures of the finished models but I do not see any way to upload them here. I want to find a solar self-consumption manager for my home to maximize the self-consumption of my grid connected solar array and wind turbine. This is because our tariff for feeding into the grid is about half of the total variable costs to buy electricity. Since I have an efficient home which is powered electrically (soon heat pumps), I would like to avoid exporting energy in the winter and instead use it to heat the house. This type of controller is not yet available in Canada or the US. Do you think this could be done with a morningstar relay which could have a CT as an external voltage input and then switch 3 relays to activate electrical loads based on the amount of power being exported? Or – could I make something even simpler based on the voltage controlled switches you mentioned in your blog? Not sure of the voltage from a CT but it is likely something like 33 mV. Thanks in advance! I have never had occasion to make anything like this (being off the grid) but I will say that you need more than a current transformer. You need so combine voltage and current to get the direction of the energy flow. The phase relationship between current and voltage can mean import or export with the same current. Here in the UK there are several products that sense export and defeat it with diversion to heating loads. I think this is because many contracts make a payment for exports that are not measured but “deemed” to be at a certain level without metering them. So it pays to avoid exporting and to continue being paid anyway. I doubt if these product would work at 60Hz. However there is no reason in principle why the same techniques should not be applied on your side of the Atlantic. I’m currently doing my dissertation on developing a means of harnessing wind and wave energy simultaneously and your work has been of a great deal of help regarding my blade design research. However, I was wondering if you could just clarify how you derived the formula used to calculate ‘Recommended Chord’ in your blade design spreadsheet. Any help would be hugely appreciated. It shows the diagram that you need. You can use other relays such as auxiliary relays in some inverters or the “voltage controlled switch” (VCS) by Solar converters. From me and my gang of “mad scientist”, experimenters and project builders…. You have brought us a lot of joy! Thank you! Thank you for sharing this freely. Not many out there just willing to hand out their hard earned knowledge. Heya i am the first time in this article. I discovered this particular table and that i still find it truly helpful & the item reduced the problem out a lot. I’m hoping to supply one thing again as well as enable some others like you assisted everyone. Could you please let me know how I can get in touch with you in relation to your wind turbine course in Ireland this year (June I believe). I couldn’t find an address for you. I hope you can make it, it should be fun! Pennine Community Power has a 10kWh Bergey community wind turbine that have been operating for six months. However, it does make several types of noises that disturbs the neighbours of the turbine to the extend that we are loosing community support. The worst type of noise is when the turbine furls, which is does at 11.5kWh production. As we are placed on the top of the Pennines this actually happens quite frequently during the winter months – like last week. There is also another resonance noise in lower wind speeds, which is like a honking, metallic noise. We have sent HD video and audio recordings to Bergey in the USA via SIAC – the UK installers for their engineers to look at the problem. We were wondering if you have come accross these noise problems with Bergey turbines before and if you know of any solutions. If you need any specific details from us please let me know and it may be best if you reply directly to my email address rather than us communicating via your blog. I’m an engineer who has left the mainstream to start a family here in rural Galloway. Initially I was looking at making a wind turbine but for MCS so I got into hydro. After about 6months of trying to get accredited they scrapped MCS for hydro. I have now built 10 hydro schemes ranging from 8 kW to 40kW. These mainly include my own design and build of turbine but I have also installed an Ecowave Crossflow and a Hydrover Turgo. My father has a farm close to me which has two sizeable watercourses but unfortunately they are flat so no potential for hydro. I am now looking at building a wind turbine again and believe that there isn’t a MCS requirement above 50kW so that is the size I want to build. At present I am looking at 24m hydraulic lift sectional tower, 3 blades, upwind, pitch control, belt drive and 4 pole induction generator with direct sync to the grid. I wonder if you have any words of encouragment or advice for my plans? Everybody around me thinks I am crazy! 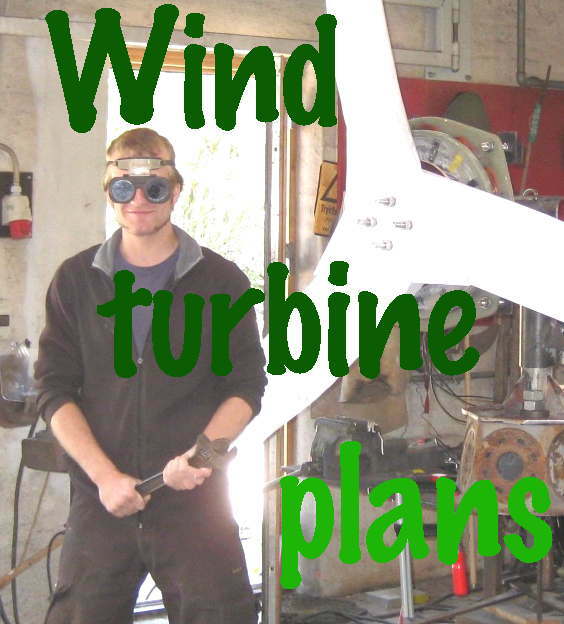 I have your wind turbine recipe book and think what you are doing is great. Unfortunately the FIT scheme has not encouraged others to make renewable turbines. To my knowledge, you are the only other person in Scotland who is actually making turbines. It’s great to know that you are doing this. I built a few hydros in the 1990s and they always seemed more worthwhile than wind turbines. I used induction motors and Nigel Smith’s control stuff which I imagine you are using sometimes too. Hydro seems to be a lot more reliable than wind energy. But the sites are limited, and somehow people always persuade me to do wind stuff. 50 kW wind does seem a bit ambitious for sure on your own, and I wonder if it could be more effective to buy a secondhand Vestas or Bonus or the like? Maybe MCS would not work on secondhand stuff, in the same wonderful logic that excludes DIY from the small wind arena. Seems to me that the whole point of small renewables is to encourage self reliance, and human scale participation. Using secondhand stuff is also more sustainable that building new. If you want a partner in the 50kW wind turbine then you might try http://www.pelicanwindpower.com which is a 45 kW design that I imagine could be adapted. He is looking for people to take up his design. Not sure whether this is the correct place to post but here goes. 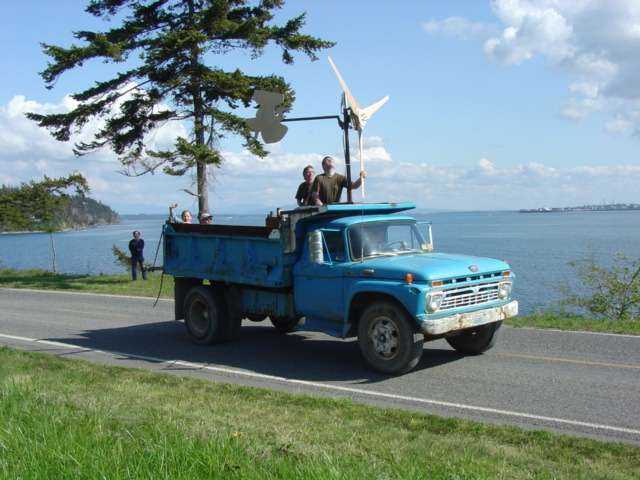 I have a 1KW commercial wind turbine with a really poor furling system. I wanted to use your design for a furling system and adapt the turbine to fit. Would I need to make any changes to the measurements of your furling system or could I just build it as per your book. hi Pete, This seems to be a chat of some sort 🙂 Yes you can use the same dimensions taking care over the positioning of the blades well forward of the tower. 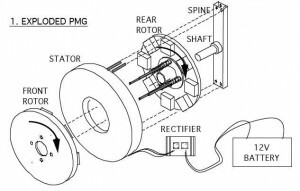 It may not work so well if the rpm is high in strong winds as tends to happen with a lot of conventional alternator designs (using laminated cores in the stator). My name is Stephen. I am with a media group that are doing a documentary about self sufficiency and energy consumption. Is there any possibility that we can come and visit Scoraig to get some shots and hopefully some interviews about this subject matter. Just wanted to say Great website Hugh ! Happened to come across your site while surfing the net and ended up reading about all of your projects..very intriguing and inspiring !! I’m back from a workshop in France with Tripalium, and as I’ll be travelling to India next month to work on a off-grid solar PV project, I’d like to know more about the potential of small wind turbines in India (specifically Utta Pradesh, north) and raise the question with the organisation I’ll work with. I’ve checked windempowerment.org but I see no member (organisation) from India. Do you know of any projects or people there that I could contact ? I’m just starting to look seriously at wind power, I’ve even bought “Choosing Windpower” from CAT. You must be aware of the “wind lens”* development from Japan. Do you think a wind turbine can have a three fold increase in power output by such a device? In case you don’t know what I’m talking about put “wind lens” into a search engine. The idea of augmenting wind by funneling it into a smaller hole is an old one and it has been seriously investigated and rejected by several companies in the past. In the end the gains are small in relation to the cost of the required structure. I am afraid this is another example of people failing to learn from the lessons of the past and reinventing stuff that does not work. see for example this article by Paul Gipe. This idea is not funneling into a hole, a ring is constructed around the blades at their periphery, it causes turbulence behind the turbine producing higher wind flow through it. Yuji Ohya of Kyushu University, Japan did the work. Google “wind lens” and see it on Wikipedia. They claim a three fold through put. All I ask is that you look at it. I studied the material that is linked to from the wikipedia site and the device is a diffuser, just like the ones in previous attempts. OK they have obtained enhanced output, but these are academic studies and it remains to be seen if they can achieve commercial success with the idea which has failed to do so on several previous occasions. I hope that they are building on these previous attempts and not simply reinventing the wheel so to speak. Thank you for your input and the benefit of your experience. I suppose the only thing to do would be take say a 500 W machine run it, then add an anulus and see if it improved. I do not doubt that it will give a higher output. I do doubt that it will be simpler or cheaper or better than building the larger turbine to achieve this same output. I just finished building my first Piggot windmill. I build it in Malawi where i am living at the moment. I want to use this one to teach the people here how to build windmills. Now i finished building the windmill i am focussing on the electrical installation and batteries. I am reading about the tristar and other equipment which would be handy but are not easy to find here in Malawi and probably to expensive for the people here. I am looking for an inexpensive and simple (i’m not an electrician) way to connect my windmill to batteries. Do you have any ideas? When I started out we used to just manage everything manually and that was OK because we were pleased to get any power. 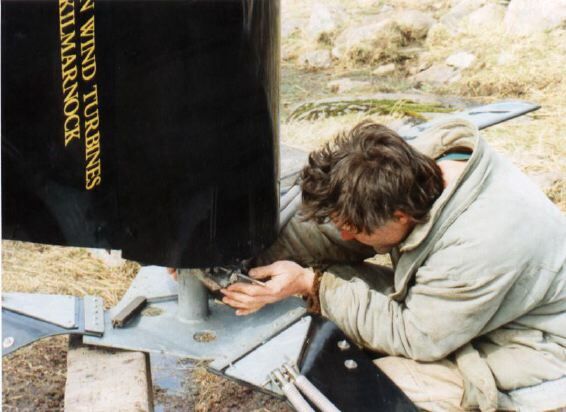 We connected all kinds of rubbish batteries in windy weather as dump loads, and then quickly disconnected them when we had got what we wanted out of them. We looked after our good batteries and saved them for later. I remember a lot of crocodile clips and I got a rash on my hands. If you want to chat with others in africa and around the world, there is a forum at windempowerment.org that could provide a line of communication for discussion of these issues. Some stuff works differently in places where people can’t afford to buy the best control systems but they still need power. 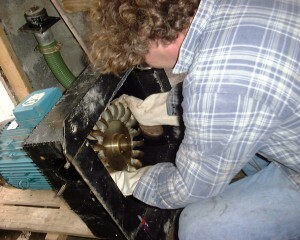 We would like to try micro hydro power and have looked at powerspout. But I am not a technical genius and find things a little confusing. We have several fast flowing small ditches that come off the Tap O’Noth to our croft. The old dam (now silted up) ran an old threshing machine) we could reopen this or use free running ditches. I do niot really understsand how to measure the flow – I get filling the bucket but how do you know the height, is it just where I can see the water on our croft or right from the top of the ditch (several hundred feet long several hundred feet drop)? Really keen to do this but not at all sure I could install it myself. Do you know anyone near us I copould go and see . We live at Rhynie in Aberdeenshire – See our web site. Many thnaks. PS Just told several solar panel people to get packing. It’s be handy if you knew somebody who could install the pipes and so forth on your land, and an electrician to connect it to the grid. I’d prefer not to be installing and supporting stuff in Aberdeenshire without local support. If you have a source of water a long way up the hill then the best thing is to check the flow from time to time up there and see how much water you could get at that point. (It would have to be captured and fed into a pipe) Then figure out the length of the pipe and the drop in height from that point to your proposed turbine site. Then I an help you, or you can go to the advanced calculator and see what the options are yourself. I hope this helps. 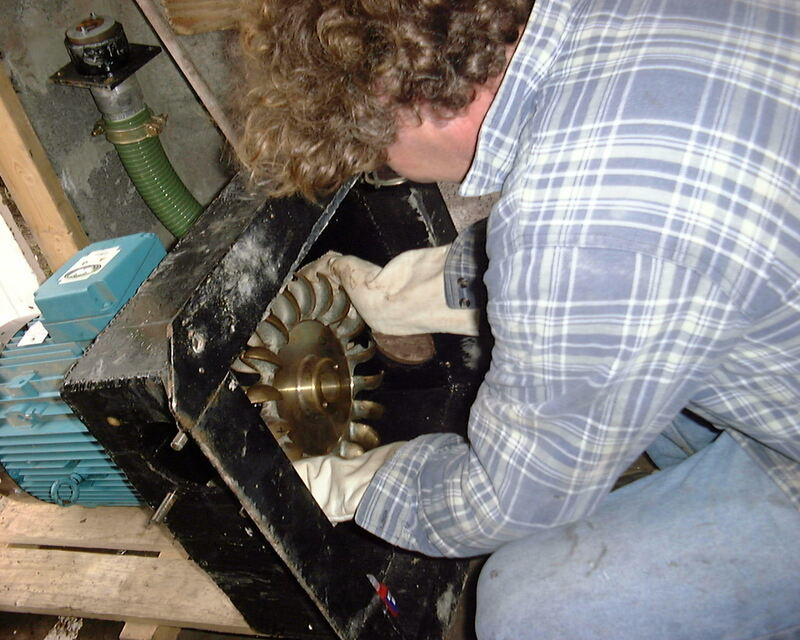 Small hydro turbines are really great if you do have a site that is suitable. I was referred to your site by Sid …? in Balbriggan, Ireland. Not sure if you actually know him, but he has done some, mostly theory I think, work on windmills. I contacted him initially, to ask about NdFeB magnets, and whether it is viable to boost their flux with an auxilliary coil .. making a hybrid magnet. He considered it, but doesn’t know for sure how well it would work. I have just erected a 1.8m windmill on my little ship “Portisham”, a retired “ham” class minesweeper. She is my home … which when cash allows, I may bring for a visit to you. Call in if you can. Unfortunately, due to financial constraints, I will not be able to visit your workshop in Leitrim. I am originally from a barge in Jamestown, nr Ck-on-Shannon. I bought a 2.5kW brushless alternator, ex military, for £3 on ebay, and bonded PMs in between the prongs of the magnetic commutator … ie that is the right term ? I have yet to see if it is enough to self start the generation. My longer term idea is to take a generic brushless alternator, remove the steel shaft and replace it with non-ferrous … composite/brass/bronze, and fit a Cylindrical PM inside the stationary energiser coil. This would allow a custom regulator to either boost, or suppress the PM’s flux. Similarly, if I took 230V generator core and rewound that for my 28v system, I could use, what I guess would be a highly efficient core, instead of winding discrete coils as per most PM types. Another idea I have yet to try is to use flat wire to wind “your” type ? For Deisel fired generator, I acquired a big 36V pancake motor which I intend to use to charge batteries, while also using it’s cooling water to heat the boat(CHP). This is not suitable IMO, for windmill, as it really needs a fairly constant speed, AND it’s brushes cause drag. Nice big PM’s, but bonded into the shell. Keep up the good work, esp in/for the 3rd world. Avid reader of your site, great work! I see you use word press to power your blog…quick tip to improve your seo and searches in google – log into your admin section, click on settings on lhs, and then on permalinks. Currently your blog is on default setting- change this to the third one down – month and name. This imbeds the keys words in your blog title into url – resulting in wind turbine related keys words in ur title – which google loves. Yes there are some truly awful rip-offs out there, such as earth4energy and the like. Fortunately they do give refunds quite easily. But the sheer dishonesty is depressing. It’s like a glossy cardboard box containing nothing. A picture of a glossy cardboard box actually. You never even get the glossy box. People probably do not easily realize that Energy could easily be the foundation for a rational economy, and a new kind of money… I like to hear comments on this point. I’m going near a city called Dali. The city for some strange reason has become a tourist attraction… (that’s why near, and not in it…) This is the land of Shangrila, I guess… the locale that bears that name is in that region..
Glad you like the site. YOu might also like to visit http://www.windempowerment.org for a wider view of what can be done in the world at large. I hope you get to shangrila! You have a great web site and I’m glad you’re there. I am just starting a claim with Paypal and Plimus to get my 49.00 US back for the purchase of the Magniwork materials which were sold as a “free energy machine”. They actually copied your generator plans to the T and sold them along with a few extra circuits and called the whole thing “self sustaining free energy”. I will try and give you an update as to how my request for a refund is going. If I lived in an area where there was more wind I would surely be building one of your designs. Even if it was from a “wrong source” the generator itself looks like it would work fine. I also wondered if going to stronger magnets would increase the power output, and it sounds like it does. Have a great life and much success!